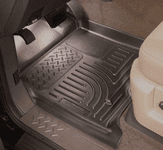 Husky Floor Liners for the front, second and third seat and cargo areas of sport utility vehicles and pickups protect the carpeted areas of your vehicle from water, snow and mud. Each pair fits like a glove, clean-up easily, and are made of a patented rubberized thermo-plastic material. All HUSKY LINER products are guaranteed not to crack or break. Items are available in Black, Grey and Tan. Husky Liners are made to fit most sport utility vehicles and pickups. Protect every inch of your carpet from the unexpected, even gasoline and battery acid! Smooth arcing ribs will contain and divert fluids away from your vehicle's carpet and cargo. Covers the center hump of your vehicle for full protection from stains!